Last year Lamy have rather silently updated their fountain pen converters model numbers. Converter Z24 (red one, for Safari, Al-Star, etc.) has become Z28, and the model Z26 (black one, for Studio, Linea, etc.) has become Z27. Is there a difference? Z26/Z27, at the first glance, hasn’t changed at all. The change in model number most likely motivated by the change in manufacturing process and/or materials used, but it is impossible to tell for sure. The difference between Z24 and Z28 is far more obvious, though. The part that connects piston handle and the body of the converter is now made of metal (aluminum, probably) instead of black plastic. Do you need to upgrade? No, not at all. New converters work exactly the same. But the new Z28 will indeed look better in Lamy Vista. 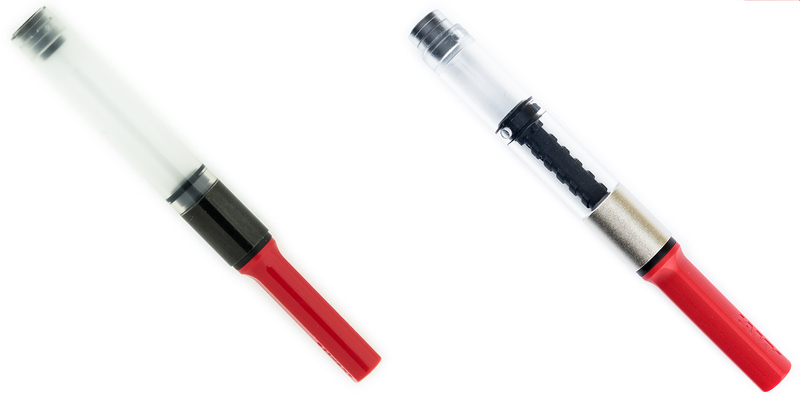 On the picture above: Lamy Z24 converter — on the left, and Lamy Z28 converter — on the right.